Public cloud services and mobility are driving business needs where the Internet and MPLS play an equally important role for enterprise connectivity. Network planners must establish a unified WAN with strong integration between these two networks to avoid application performance problems. 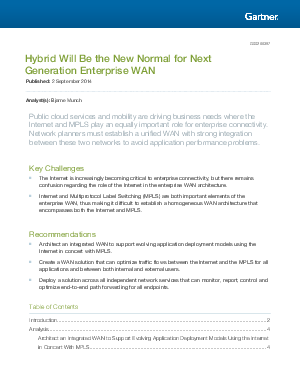 Architect an integrated WAN to support evolving application deployment models using the Internet in concert with MPLS. Create a WAN solution that can optimize traffic flows between the Internet and the MPLS for all applications and between both internal and external users. Deploy a solution across all independent network services that can monitor, report, control and optimize end-to-end path forwarding for all endpoints.